Sash windows have been around for hundreds of years. Sash windows have been around for hundreds of years and are made of one or more movable sash frames that hold panes of glass. These panes may be separated from other panes (or lights) by muntins (or glazing/sash bar). The oldest surviving examples of sash windows were installed in England back in the 1670s. Traditional problems with wooden sash windows include rot, swelling or distortion of the woodwork, rattling in the wind (due to shrinkage of the wood), and problems brought on by careless application of paint. 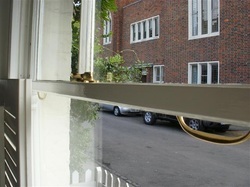 The sliding mechanism makes sash windows more vulnerable to these problems than traditional casement windows. Sash windows are relatively high maintenance, but offer advantages in return (looks, abides by laws (relating to older houses and buildings), natural resources etc). It is also possible to clean all the glass from within the building by sliding the two panes to different positions.